Chris Hughton in the dugout during the 5-0 defeat Bournemouth. Image courtesy of Charlie Crowhurst on Getty Images. The Brighton manager talked about Brighton's opponents and how it could have been worse. Brighton manager, Chris Hughton said his sides 5-0 defeat to AFC Bournemouth could have been much worse. Hughton had the following to say on Bournemouth when speaking to Seagulls.co.uk: "We came up against a very dynamic Bournemouth side and we just couldn’t handle them. They had the ability to pick us off in the areas that they needed to. The only positive to come from today's game is the fact that Cardiff did not make up ground on Albion, after they were beaten 2-0 by Burnley, thanks to two goals from ex-Brighton striker, Chris Wood. 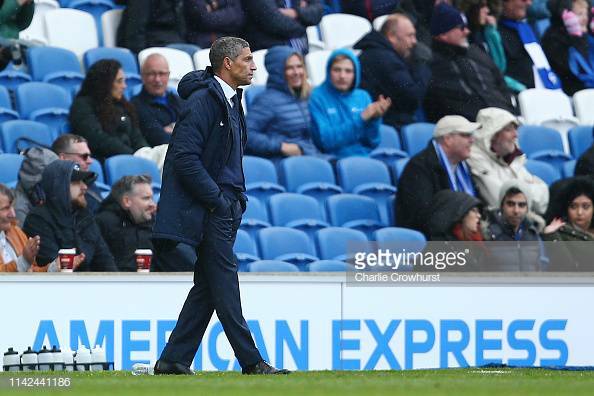 Hughton said Tuesday's game will be important: “We don’t have a choice but to turn it around, and the character of the players will be important come Tuesday night.